March and April is swarm season in the Central Valley. 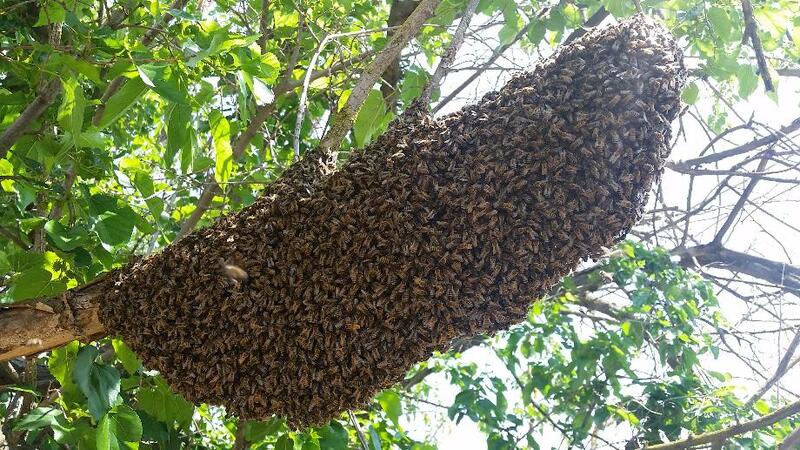 If you see a cluster of bees hanging from a branch or other structure give us a call and we'll come pick them up and give them a good home in a safe area. Honey Bee Rescue Hotline: 559-869-8822. $20 for gas is appreciated! Many People buy our honey to help relieve seasonal allergies. To be most effective, the honey should be raw, unfiltered and be produced within 50 miles of your home. Our honey is perfect for that if you live anywhere in the vicinity of Fresno, Clovis, Visalia, Hanford, or Madera. At Kingsburg Honey, we are committed to bringing to you the most flavorful and healthful honey possible. How do we do that? By leaving it alone. God has designed the perfect sweetener and we don't take anything away from it. When honey is heated and filtered, it loses more than just flavor, it loses a lot of the health benefits of this unique whole food. Therefore, all our honey is raw and unfiltered. If you ever want to visit our bees, just let me know. I'll make sure you don't get stung! Click on the video below to learn all about us.